THE Dead Sea valley is the deepest spot on earth. It dips down between Israel and Jordan, 1,300 feet below sea level, to what is known as the Dead Sea. Virtually nothing grows here. Fish cannot survive in the water of the Dead Sea, for it is many times saltier than sea water. Around the desolate shore stand the stumps of ancient trees, encrusted in salt. In summer the valley bakes like an oven. It is hard to believe that this whole area was once like a beautiful garden and exceptionally fertile. The legendary cities of Sodom and Gomorrah flourished in this very place. And they were very large cities. Archaeologists working across the valley from the sites have found immense cemeteries containing over 1,000,000 graves. This gives some indication of the size these cities had grown to before destruction rained down upon them from out of a blue sky. SODOM and Gomorrah, according to the records, were hotbeds of sexual perversion and immorality. So corrupt had the cities become, that they passed even the limits of Divine forbearance. Today, the name “Sodom” has become synonymous with acts that were said to be performed in that wicked city. Upon the whole valley fire and brimstone (sulphur) was rained down. The Bible states “the smoke of the country went up as the smoke of a furnace.” (Gen 19:28). Everything was totally incinerated, leaving little more than ash. There is no example in the world of any ‘natural’ disaster that resembles the phenomena found at these sites, not even destruction by volcanic eruption. For example, in Pompeii, a city destroyed by the Mt Vesuvius eruption, volcanic ash smothered everything and buried the city. Inside Pompeii, paintings in pristine condition can still be seen on the walls of the houses. People and animals buried during Pompeii's destruction have been unearthed as empty cavities. By contrast, everything at the Sodom & Gomorrah sites has been turned totally to ash. A skeleton found by Ron Wyatt in one of the lost cities still had human form but was composed of ash. Even the marrow, visible in the bones, was totally turned to ash. THROUGHOUT the sites are very unusual balls of pure elemental sulfur. The Bible states “...the LORD rained upon Sodom and upon Gomorrah brimstone and fire from the LORD out of heaven.” (Gen 19:24) Considering its supernatural origin, one would expect to find unique characteristics in such sulfur, and this is indeed the case. Its composition reveals lengthy exposure to high temperatures. Sulfur found in geothermal regions is invariably the “rhombic” form, evident from it’s familiar bright yellow colour. By contrast, the brimstone from these Dead Sea sites is the pale white “monoclinic” form. Sulphur changes to this form when exposed to high temperatures for an extended period of time, as would have been the case. 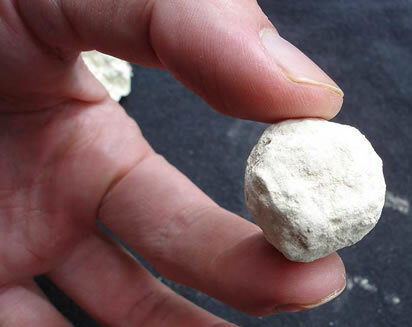 X-ray Fluorescence Semiquant analysis and other tests reveal the sulphur balls to be up to 98.4% pure sulphur, significantly more pure than naturally occurring sulphur.